"Embezzlement: A True Crime Story is a humor filled narrative which follows the life of a young man as he makes a series of wrong choices..."
Embezzlement: A True Crime Story is a humor filled narrative which follows the life of a young man as he makes a series of wrong choices and then struggles to make amends through raw determined effort and by the grace of God. The first person, true timeline narrative flows easily and gives a full picture perspective of how easily anyone can make one wrong decision with big consequences. The clear message throughout the book is learning from and then overcoming one's mistakes—this is rarely easy, but always possible. While the serious story line is covered in a cloak of humor, the detailed antics of a young and lost Cross render this book best suited for a mature audience. The reader follows Kevin Cross from adolescence, into young adulthood and through the process as he becomes a man; repenting of himself, growing in character and persevering through the toughest of times. The outcome is a mindset of financial principles which are a benefit to all and the ultimate goal of the narrative is to inspire a Christian view of money management. As I have been interested in becoming a better steward for some time now, I was intrigued by the mention of various individuals who have been an influence to Cross' views of financial fitness and have been prompted to continue steadfastly in the fight to debt freedom. I visited Kevin Cross’ money management website, account417.com, and have since added it to my favorites. It has endowed me with the understanding of how following the principles lead to the fruition of my financial goals. 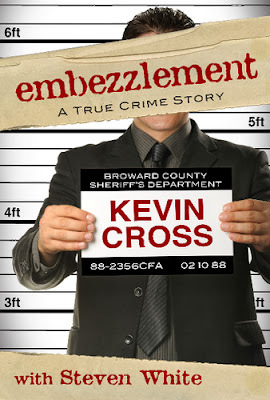 Embezzlement: A True Crime Story is a book which should appeal to a broad audience. True crime enthusiasts would enjoy if they are looking for a lighter read. The story is an in-depth look into the mind of the author as he compiles his scheme, brings in a friend and foolishly flaunts the pirated treasure. This would appeal to those who have an interest in the psychological side of things and like to analyze individuals and why they make the choices they do. The financial aspect was a bonus--there are some great tips and anyone who needs some hope on their path to financial freedom or entrepreneurship will be inspired to persevere. Disclosure: We were provided a review copy of this book at no cost by the publisher. This post contains affiliate links.